For the general history of Jews in the territory of the Lithuania, see History of the Jews in Lithuania. "Litvish" redirects here. For other uses, see Litvish (disambiguation). Lithuanian Jews or Litvaks are Jews with roots in the present-day Lithuania, Belarus, Latvia, northeastern Suwałki and Białystok region of Poland and some border areas of Russia and Ukraine. The term is sometimes used to cover all Orthodox Jews who follow a "Lithuanian" (non-Hasidic Ashkenazi) style of life and learning, whatever their ethnic background. The area where Lithuanian Jews lived is referred to in Yiddish as ליטע Lite, hence the Hebrew term Lita'im (לִיטָאִים‎). Lithuania was historically home to a large and influential Jewish community that either fled the country or were murdered during The Holocaust in Lithuania. Before World War II, the Lithuanian Jewish population was some 160,000, about 7% of the total population. Vilnius (then Wilno in the Second Polish Republic) had a Jewish community of nearly 100,000, about 45% of the city's total population. There were over 110 synagogues and 10 yeshivas in Vilnius alone. About 2,000 Jews were counted in Lithuania during the 2005 census. Quoting the research done by H. G. Adler into Poland during World War II called Theresienstadt 1941–1945, there were "80,000 Jews conscripted into Poland's independent army prior to the German invasion who identified themselves as Lithuanian Jews". Using different sources Holocaust researchers claim there were between 60,000 and 65,000 Jewish soldiers in Poland's independent army who identified themselves as Lithuanian Jews. The Yiddish adjective ליטוויש Litvish means "Lithuanian": the noun for a Lithuanian Jew is Litvak. The term Litvak itself originates from Litwak, a Polish term denoting "a man from Lithuania", which however went out of use before the 19th century (having been supplanted in this meaning by Litwin), only to be revived around 1880 in the narrower meaning of "a Lithuanian Jew". The "Lithuania" meant here is the territory of the former Grand Duchy of Lithuania. 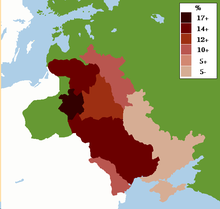 Of the main Yiddish dialects in Europe, the Litvishe Yiddish (Lithuanian Yiddish) dialect was spoken by Jews in Lithuania, Belarus, Latvia, Estonia and northeastern Poland, including Suwałki, Łomża, and Białystok. However, following the dispute between the Hasidim and the Misnagdim, in which the Lithuanian academies were the heartland of opposition to Hasidism, "Lithuanian" came to have the connotation of Misnagdic (non-Hasidic) Judaism generally, and to be used for all Jews who follow the traditions of the great Lithuanian yeshivot whether or not their ancestors actually came from Lithuania. In modern Israel, Lita'im (Lithuanians) is often used for all Haredi Jews who are not Hasidim (and not Hardalim or Sephardic Haredim). Other expressions used for this purpose are Yeshivishe and Misnagdim. Both the words Litvishe and Lita'im are somewhat misleading, because there are also Hasidic Jews from greater Lithuania and lots of Lithuanian Jews who are not Haredim. The term Misnagdim ("opponents") on the other hand is somewhat outdated, because the opposition between the two groups has lost much of its relevance. Yeshivishe is also problematic because Hasidim now make use of yeshivot as much as the Litvishe Jews. The characteristically "Lithuanian" approach to Judaism was marked by a concentration on highly intellectual Talmud study. Lithuania became the heartland of the traditionalist opposition to Hasidism. Though outnumbered and named "misnagdim" (opposers) by the Hasidim, the Lithuanian traditionalists believed that their standard Rabbinic Judaism predated Hasidism and was Judaism in its original and authentic form. Differences between the groups grew to the extent that in popular perception "Lithuanian" and "misnagged" became virtually interchangeable terms. However, a sizable minority of Lithuanian Jews belong(ed) to Hasidic groups, including Chabad, Slonim (Hasidic dynasty), Karlin (Pinsk), and Koidanov. With the spread of the Enlightenment, many Lithuanian Jews became devotees of the Haskala (Jewish Enlightenment) movement in Eastern Europe pressing for better integration into European society, and today, many leading academics, scientists, and philosophers are of Lithuanian Jewish descent. The most famous Lithuanian institution of Jewish learning was Volozhin yeshiva, which was the model for most later yeshivas. Twentieth century "Lithuanian" yeshivas include Ponevezh, Telshe, Mir, Kelm, and Slabodka, which bear the names of their Lithuanian forebears. American "offspring" of the Lithuanian yeshiva movement include Yeshiva Rabbi Chaim Berlin, Rabbi Isaac Elchanan Theological Seminary, Yeshivas Rabbeinu Yisrael Meir HaKohen ("Chofetz Chaim"), and Beth Medrash Govoha ("Lakewood"), as well as numerous other yeshivas founded by students of Lakewood's founder, Rabbi Aharon Kotler. In theoretical Talmud study, the leading Lithuanian authorities were Chaim Soloveitchik and the Brisker school; rival approaches were those of the Mir and Telshe yeshivas. In practical halakha, the Lithuanians traditionally followed the Aruch HaShulchan, though today, the "Lithuanian" yeshivas prefer the Mishnah Berurah, which is regarded as both more analytic and more accessible. Wearing of tefillin during non-sabbath days of the intermediate days of the festival chol hamoed. The pronunciation of the holam as "ej". Although not widespread and uniform among Lithuanian Jews, the "shin" being pronounced the same way as "sin". Jews began living in Lithuania as early as the 13th century. In 1388, they were granted a charter by Vytautas, under which they formed a class of freemen subject in all criminal cases directly to the jurisdiction of the grand duke and his official representatives, and in petty suits to the jurisdiction of local officials on an equal footing with the lesser nobles (szlachta), boyars, and other free citizens. As a result, the community prospered. In 1495, they were expelled by Alexander Jagiellon, but allowed to return in 1503. The Lithuanian statute of 1566 placed a number of restrictions on the Jews, and imposed sumptuary laws, including the requirement that they wear distinctive clothing, including yellow caps for men and yellow kerchiefs for women. The Khmelnytsky Uprising destroyed the existing Lithuanian Jewish institutions. Still, the Jewish population of Lithuania grew from an estimated 120,000 in 1569 to approximately 250,000 in 1792. After the 1793 Second Partition of the Polish-Lithuanian Commonwealth, Lithuanian Jews became subjects of the Russian Empire. 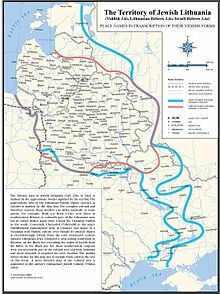 The Jewish Lithuanian population before World War II numbered around 160,000, or about 7% of the total population. At the beginning of the war, some 12,000 Jewish refugees fled into Lithuania from Poland; by 1941 the Jewish population of Lithuania had swelled to approximately 250,000, or 10% of the total population. During the German invasion of June 1941, 206,800 Jews were murdered by the Nazis and Lithuanian collaborators. Notable execution locations were in the Paneriai woods (see Ponary massacre) and the Ninth Fort. Litvaks have an identifiable mode of pronouncing Hebrew and Yiddish; this is often used to determine the boundaries of Lita (area of settlement of Litvaks). Its most characteristic feature is the pronunciation of the vowel holam as [ej] (as against Sephardic [oː], Germanic [au] and Polish [oj]). In the popular perception,[by whom?] Litvaks were considered to be more intellectual and stoic than their rivals, the Galitzianers, who thought of them as cold fish. They, in turn, disdained Galitzianers as irrational and uneducated. Ira Steingroot's "Yiddish Knowledge Cards" devote a card to this "Ashkenazi version of the Hatfields and McCoys". This difference is of course connected with the Hasidic/misnaged debate, Hasidism being considered the more emotional and spontaneous form of religious expression. The two groups differed not only in their attitudes and their pronunciation, but also in their cuisine. The Galitzianers were known for rich, heavily sweetened dishes in contrast to the plainer, more savory Litvisher versions, with the boundary known as the "Gefilte Fish Line". The Lithuanian Jewish population may exhibit a genetic founder effect. The utility of these variations has been the subject of debate. One variation, which is implicated in familial hypercholesterolemia, has been dated to the 14th century, corresponding to the establishment of settlements in response to the invitation extended by Gediminas in 1323, which encouraged German Jews to settle in the newly established city of Vilnius. A relatively high rate of early-onset dystonia in the population has also been identified as possibly stemming from the founder effect. ^ "Rodiklių duomenų bazė". Db1.stat.gov.lt. Archived from the original on 2013-10-14. Retrieved 2013-04-16. ^ "The Jewish Community of Lithuania". European Jewish Congress. Archived from the original on 2014-11-06. Retrieved 2014-11-06. ^ Shapiro, Nathan. "The Migration of Lithuanian Jews to the United States, 1880 – 1918, and the Decisions Involved in the Process, Exemplified by Five Individual Migration Stories" (PDF). Retrieved 7 December 2013. ^ "Lithuania". United States Holocaust Memorial Museum. Retrieved 2016-04-19. ^ "Vilnius (Vilna), Lithuania Jewish History Tour". www.jewishvirtuallibrary.org. Retrieved 18 October 2018. ^ "Vilnius – Jerusalem of Lithuania". litvakai.mch.mii.lt. Retrieved 18 October 2018. ^ "Holocaust Survivors: Encyclopedia – "Lithuanian Jews"". www.holocaustsurvivors.org. Retrieved 18 October 2018. ^ a b "Lithuania" (updated June 20, 2014). United States Holocaust Memorial Museum. Retrieved 2015-04-14. ^ Levin, Dov (2010). "Lithuania". YIVO Encyclopedia of Jews in Eastern Europe. Retrieved 2015-04-14. ^ ""Yiddish Knowledge Cards"". Retrieved 18 October 2018. ^ "This is no fish tale: Gefilte tastes tell story of ancestry". Retrieved 18 October 2018. ^ Slatkin, M (August 2004). "A Population-Genetic Test of Founder Effects and Implications for Ashkenazi Jewish Diseases". Am. J. Hum. Genet. American Society of Human Genetics via PubMed. 75 (2): 282–93. doi:10.1086/423146. PMC 1216062. PMID 15208782. ^ "Jewish Genetics, Part 3: Jewish Genetic Diseases (Mediterranean Fever, Tay–Sachs, pemphigus vulgaris, Mutations)". www.khazaria.com. Retrieved 18 October 2018. ^ "Genetic analysis of idiopathic torsion dystonia in Ashkenazi Jews and their recent descent from a small founder population". Nature Genetics. 9: 152–159. doi:10.1038/ng0295-152. Retrieved 2010-11-12. Encyclopedia of the Jewish Diaspora: Origins, Experiences, and Culture. Themes and Phenomena of the Jewish Diaspora, Volume 1. Avrum M. Ehrlich, ABC-CLIO, 2009. ISBN 978-1-85109-873-6. Schoenburg, Stuart; Schoenburg, Nancy (2008). Lithuanian Jewish Communities. Jason Aronson Inc. ISBN 1-56821-993-8. Sutton, Karen (2008). The Massacre of the Jews of Lithuania. Jerusalem, Israel: Gefen Publishing House. ISBN 965-229-400-4.